Hellooooo...I'm back with another Althea post! yay! 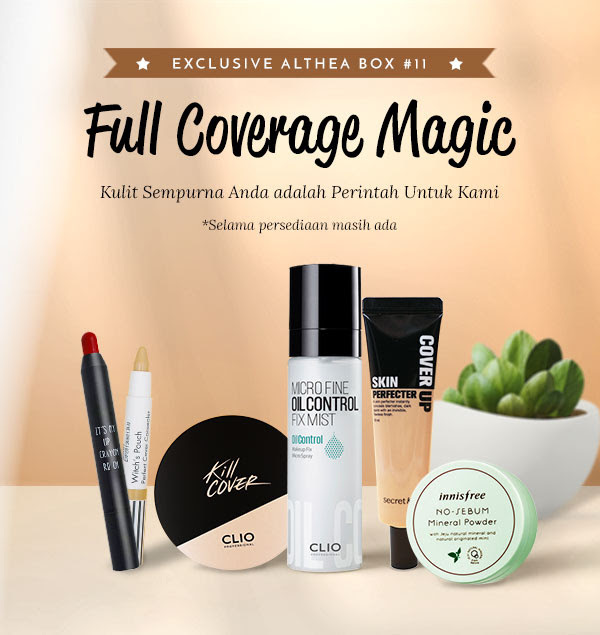 I hope you're not bored with quite many post about Althea Korea *please don't...* Thanks to Surabaya Beauty Blogger, I can got another chance to review the new project from Althea called Althea Beauty Box. What is Althea Beauty Box? "They're curated specially by the Althea Korean Team back in Seoul. Each month, Althea will release 3 beauty boxes for fans to try. They're limited edition and limited in stock, which makes them a "SOLD OUT" Item on Althea. The prices are a steal as all items found in the beauty boxes are FULL SIZE items. Unlike the conventional beauty boxes where you have to subscribe (and pay). Althea Boxes comes with no subscription fees and no surprises (heart attacks). Buy if you like what you see! Wait for the delivery 10 - 15 working days and unbox it! " More to read click here. So, I got a chance to try one of their beauty box called Full Coverage Magic. As you can see the preview of the box is quite amazing, right? Now let me do a little unboxing and mini review about my box.. This is pen type lipstick so it is very easy to use it. You just need to twist the bottom part and the lipstick will come out. The color is bold red, which I rarely use in real life hahaha but the color is cute and beautiful in my personal opinion. I usually will use 1 layer and spread it with my finger to get a more sheer color. The color is pigmented and bold but a little bit drying, so I suggest to use lip balm before apply this lip crayon. Overall, I love the simple packaging and the color. This brand is quite popular in Althea Website but I never had a chance to try it. When I knew this box will contain Witch pouch product, I'm very excited and can't wait to try it. Perfect cover concealer is a pen type concealer, it's very convenience to bring inside make up pouch and easy to use. The texture is quite creamy and coverage is quite okay. Truthfully, I always prefer cream/liquid concealer because it is easy to blends, but this is the first time I found that stick concealer also works good on me hehehe. It spreads quite easy and long lasting. Actually, I'm a little confuse with the category of this product. Since this is my personal opinion, I will called this product as a tinted moisturizer. First of all, the shade doesn't match with my skin tone. Somehow it looks a little bit too orange for my skin. and that makes me look dull. For a coverage, it just okay. Not cover big pimples or large dark spot, but for daily use that no need for heavy make up, this is just okay. Plus it's already contains SPF for the sun protection. It is a little bit drying on some dry area on my skin, so I believe people with oily skin will love this more than dry skin type. My first clio cushion ever, It comes with a refil in 1 box. The design is just simple like anothe clio products. The puff is beige color (most of cushion puff is blue color). When the first time I opened the cushion. I was surprised about how "clean" the cushion, I mean usually the cushion will have brown color *which is the product's color* but this one is quite clean with white color *with a little hint of brown color*. But worry not, when I press the puff to the cushion, the product start to come out. I don't really like fix mist before, but this one is quite popular so I was quite happy when I received it. It is water type face mist and the spray works good since the first used. I used it at the last step of my make up and it really help to make last longer espesially on T-Zone. This little powder is very popular among beauty bloggers, and I share the same opinion with them. This powder is love! It has a nice fine powder with light texture. It has white color, sheer coverage but works well to control excess sebum on my face. It is handy and comes with puff. Easy to bring and fit with any make up pouch. Overall, I'm very happy and super satisfied with Althea Box! It is seriously worth the price. 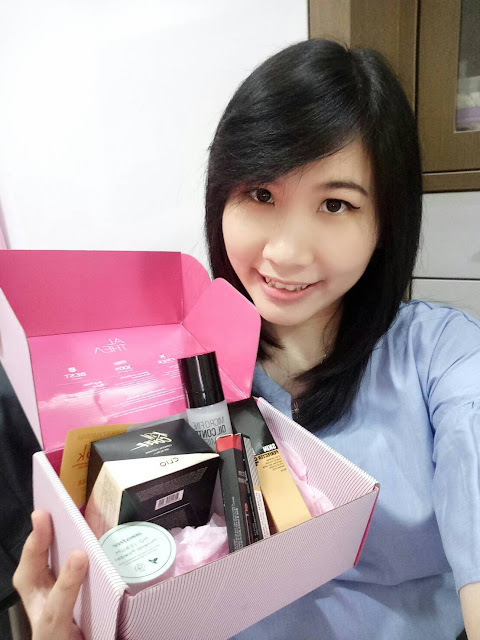 Thank you so much Althea and Surabaya Beauty Blogger for giving me a chance to unboxing this box!